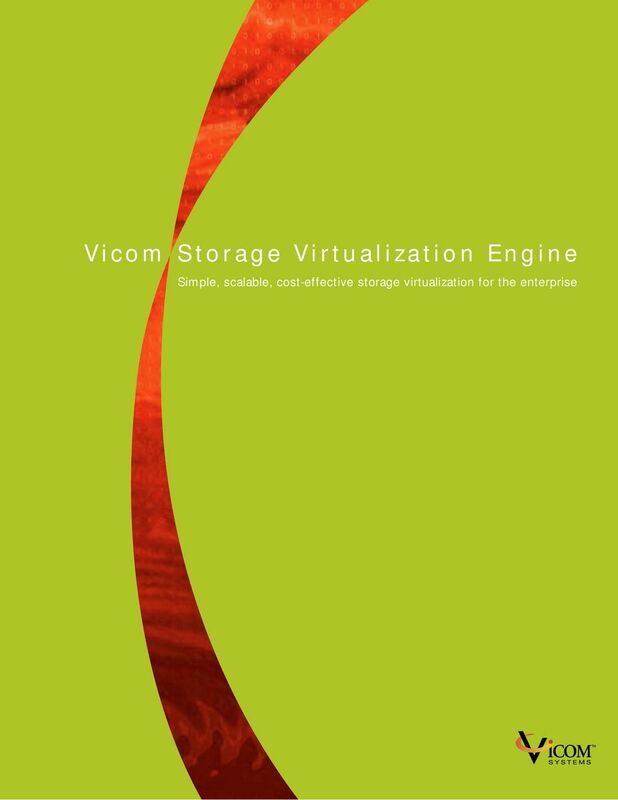 Download "Vicom Storage Virtualization Engine. Simple, scalable, cost-effective storage virtualization for the enterprise"
3 SECURE ACCESS CONTROL Centralized, network-based zone management gives granular access control to storage resources. Vicom SVE uses LUN masking and LUN mapping to restrict unauthorized access to resources. Servers can be dynamically switched between primary and secondary zones for flexible resource sharing. PLATFORM-INDEPENDENT HIGH AVAILABILITY Vicom SVE supports up to four-way mirroring, with mirror and Instant Copy (IC) drives, across multi-vendor storage, regardless of storage subsystem functionality. Spare drives, allocated in advance, are activated and automatically synchronized in the event of a failed mirrored drive. Vicom Independent Distributed Routing (VIDR) architecture provides an exceptionally scalable, redundant architecture for managing networked storage. Multi-protocol support enables Vicom SVE to incorporate a wide variety of storage hardware and server operating systems into the networked storage pool. NON-DISRUPTIVE, LAN-FREE BACKUP Vicom SVE supports third-party backup and recovery software by using IC drives. IC drives are separately addressable mirror copies that support active synchronization, and unmount and remount to a backup server. This process eliminates I/O contention and offloads backup from the LAN. VICOM SVE CONSISTS OF: Vicom SVE software suite º SV SAN Builder º SV Zone Manager º SV SNMP Agent Vicom SVE hardware modules º SV Router What is Storage Virtualization? Storage virtualization masks the physical characteristics of storage hardware, presenting storage users with a unified, logical pool of shared networked storage. Storage administrators have unlimited flexibility to create logical storage devices that better meet the needs of business applications. Storage virtualization enables a single storage drive to appear as more than one virtual drive, can make multiple physical drives appear as one logical drive, and provides complex services like mirroring across dissimilar hardware. Storage virtualization enables efficient, incremental allocation of storage for cost-effective, managed growth. What are the Benefits of Storage Virtualization? Storage virtualization enables storage administrators to manage more disk space than they would otherwise be able to. Storage virtualization makes all storage devices look the same, no matter what the vendor or connectivity protocols, and enables uniform application of services such as mirroring, security, backup, and recovery to be administered to all devices from one management interface. Why Vicom Systems? Vicom Systems has been providing data connectivity products to customers worldwide for many years. As the industry pioneer in storage virtualization technology, Vicom has installed its products at thousands of customer data centers that are running business-critical applications. 4 Vicom SVE Software Suite SV SAN BUILDER SV SAN Builder enables efficient configuration and utilization of virtualized network storage. SV SAN Builder gives storage administrators complete configuration control of networked storage pooled by Vicom SVE. This application allows configuration of virtual, composite, mirror, Instant Copy, and spare drives. SV SAN Builder offers: º Centralized SAN administration º High availability replication options º Efficient storage allocation º Managed incremental growth º Event monitoring and notification SV SAN Builder software is fully integrated with Vicom SVE and provides a comprehensive suite of storage administration services. It gives storage administrators a single administrative interface to all networked storage resources, including multiple SANs. SV SAN Builder allows easy configuration of Vicom SVE high-availability mirroring and complex virtual drives. SV SAN Builder software offers an intuitive graphical front end and a command-line interface for easy, script-driven automation. Event monitoring and error logging can be configured with eventdriven and pager notification. 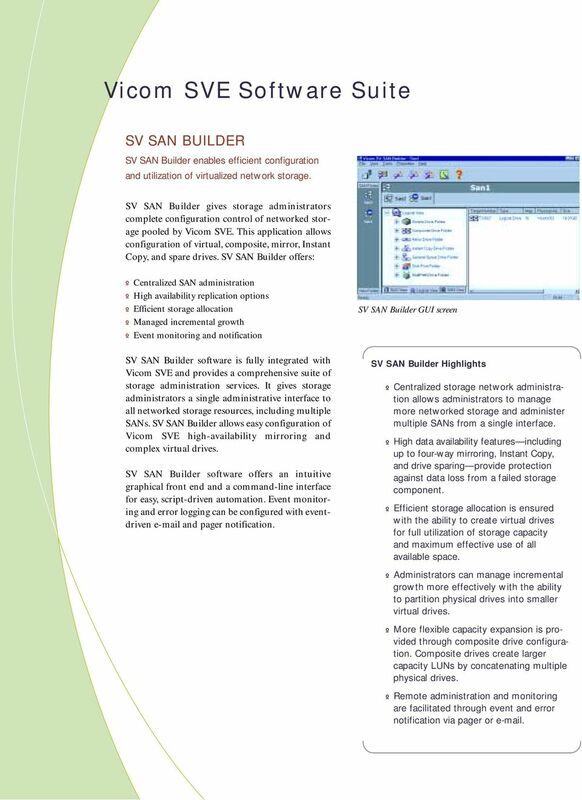 SV SAN Builder GUI screen SV SAN Builder Highlights º Centralized storage network administration allows administrators to manage more networked storage and administer multiple SANs from a single interface. º High data availability features including up to four-way mirroring, Instant Copy, and drive sparing provide protection against data loss from a failed storage component. º Efficient storage allocation is ensured with the ability to create virtual drives for full utilization of storage capacity and maximum effective use of all available space. º Administrators can manage incremental growth more effectively with the ability to partition physical drives into smaller virtual drives. º More flexible capacity expansion is provided through composite drive configuration. Composite drives create larger capacity LUNs by concatenating multiple physical drives. º Remote administration and monitoring are facilitated through event and error notification via pager or . 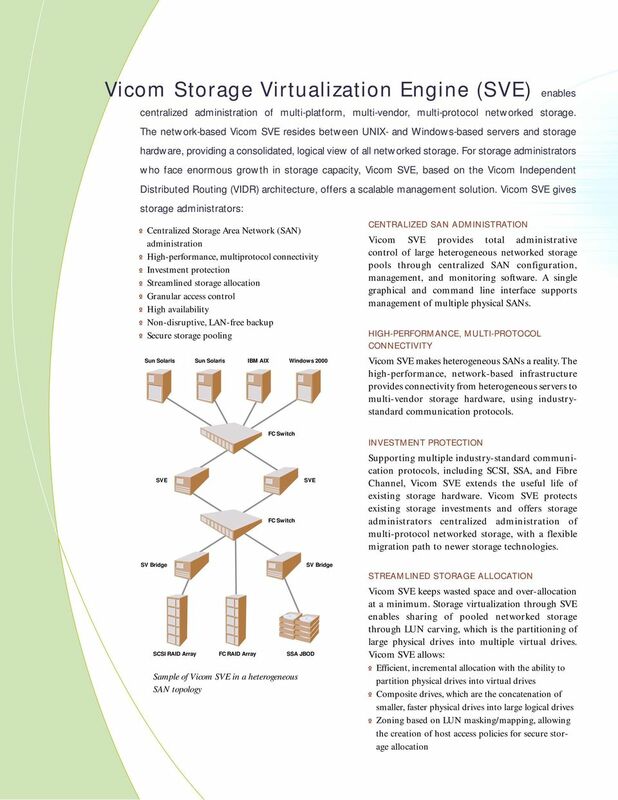 5 SV ZONE MANAGER SV Zone Manager provides secure, centralized access control for virtualized network storage. 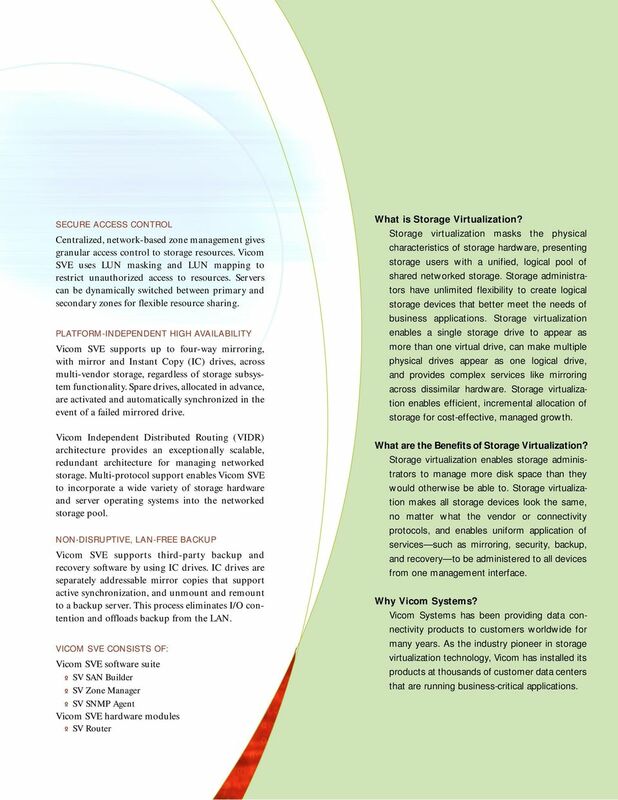 SV Zone Manager allows storage administrators granular control over access to virtualized storage. 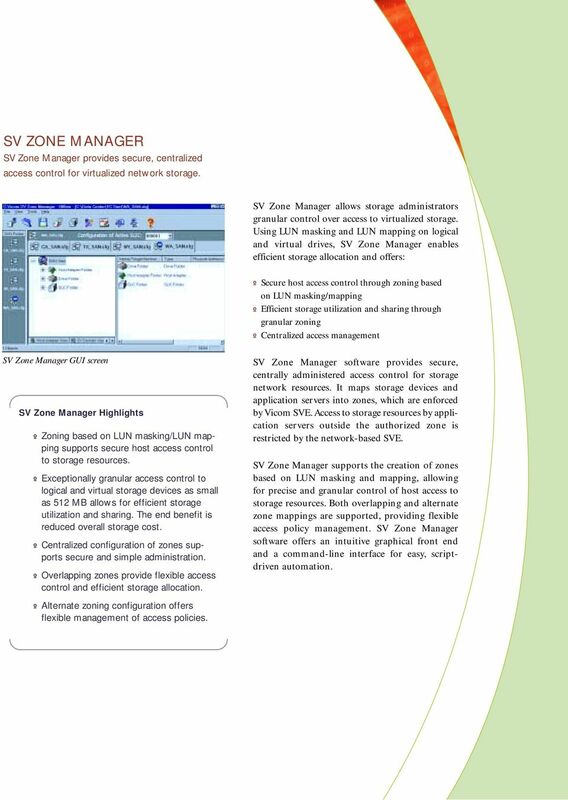 Using LUN masking and LUN mapping on logical and virtual drives, SV Zone Manager enables efficient storage allocation and offers: º Secure host access control through zoning based on LUN masking/mapping º Efficient storage utilization and sharing through granular zoning º Centralized access management SV Zone Manager GUI screen SV Zone Manager Highlights º Zoning based on LUN masking/lun mapping supports secure host access control to storage resources. º Exceptionally granular access control to logical and virtual storage devices as small as 512 MB allows for efficient storage utilization and sharing. The end benefit is reduced overall storage cost. º Centralized configuration of zones supports secure and simple administration. º Overlapping zones provide flexible access control and efficient storage allocation. SV Zone Manager software provides secure, centrally administered access control for storage network resources. It maps storage devices and application servers into zones, which are enforced by Vicom SVE. Access to storage resources by application servers outside the authorized zone is restricted by the network-based SVE. SV Zone Manager supports the creation of zones based on LUN masking and mapping, allowing for precise and granular control of host access to storage resources. Both overlapping and alternate zone mappings are supported, providing flexible access policy management. SV Zone Manager software offers an intuitive graphical front end and a command-line interface for easy, scriptdriven automation. º Alternate zoning configuration offers flexible management of access policies. 6 SV SNMP AGENT SV SNMP Agent enables full integration of network-monitoring applications. SV SNMP Agent supports integration with network monitoring tools such as Tivoli NetView, CA Unicenter, and HP OpenView. 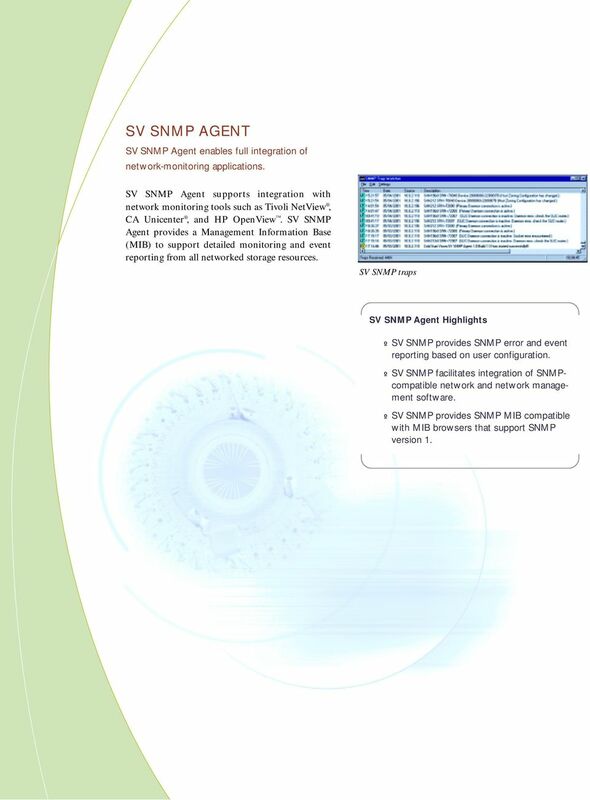 SV SNMP Agent provides a Management Information Base (MIB) to support detailed monitoring and event reporting from all networked storage resources. SV SNMP traps SV SNMP Agent Highlights º SV SNMP provides SNMP error and event reporting based on user configuration. º SV SNMP facilitates integration of SNMPcompatible network and network management software. º SV SNMP provides SNMP MIB compatible with MIB browsers that support SNMP version 1. 7 Vicom SVE Hardware Modules SV ROUTER SV Router enables scalable and reliable administration of networked storage. SV Router Highlights º A specialized hardware and operating system, based on the VIDR architecture, provides a high-performance and scalable infrastructure for secure storage sharing and pooling. º High-availability storage configuration is supported through up to three-way mirroring (four-way with Instant Copy drive), Instant Copy, drive sparing, automated fail-over, and drive synchronization. º Multiple routers in the storage network provide scalability as well as module redundancy in the data path. º The ability to partition physical drives into virtual drives achieves more efficient and cost-effective storage utilization. º Non-disruptive backup and recovery is supported through Instant Copy drives that can be automatically synchronized with mirrored sets and used for off-line backup. º Zoning approach based on LUN masking and mapping allows for logical, physical, and virtual drive mapping to zones. This zoning capability allows fine granularity logical and virtual drive assignment to hosts, ensuring more efficient usage of storage capacity. º Hardware microcode upgrade is easily done in the field. SV Router is the most scalable, enterprise-ready storage virtualization solution. Providing the intelligence behind Vicom SVE, SV Router offers: º Secure storage sharing and pooling º True heterogeneous connectivity º Centralized SAN administration º Scalable, high-performance hardware and operating system º Fully redundant architecture SV Router is a storage virtualization hardware module that provides the intelligence behind Vicom SVE. It is a network-based distributed symmetric processing platform that maps inbound storage requests to physical storage device. SV Router provides a logical, hardware-independent view of the storage pool to application servers and storage administrators. 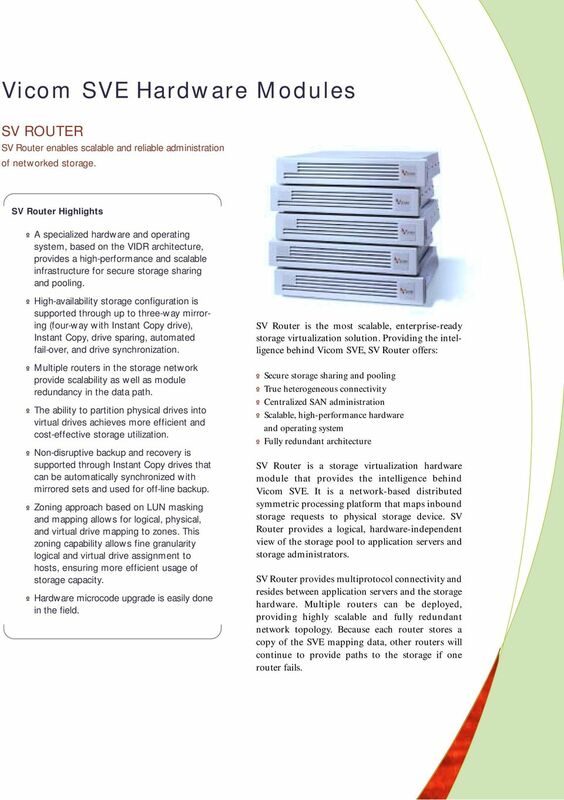 SV Router provides multiprotocol connectivity and resides between application servers and the storage hardware. Multiple routers can be deployed, providing highly scalable and fully redundant network topology. Because each router stores a copy of the SVE mapping data, other routers will continue to provide paths to the storage if one router fails. IBM Tivoli Storage Productivity Center Reduce the cost and complexity of storing vast amounts of data Ronan MAUJEAN ronan.maujean@fr.ibm.com Information Infrastructure SME Why Storage Resource Management? Vicom Data Migration Engine. An Indispensable Tool for Storage Vendors and Professional Services Organizations. 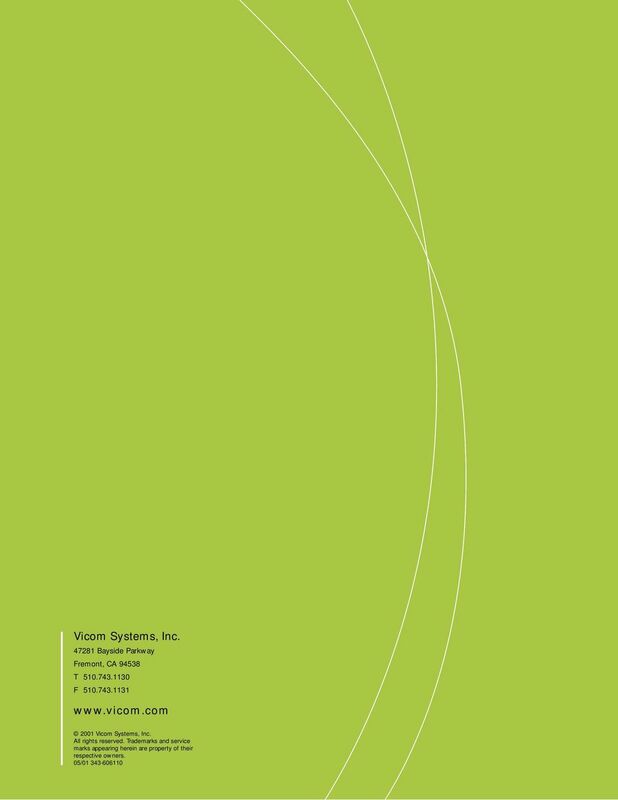 A white paper from Vicom Systems, Inc.